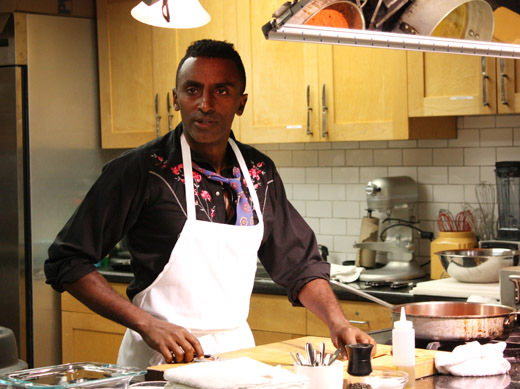 When I heard that Marcus Samuelsson was coming to teach a class at Central Market Cooking School last month, I didn’t even ask about the menu. I knew it would be a great class regardless of what was prepared. He was passing through Austin as part of the tour for his beautifully written memoir, Yes, Chef . I attended the class with a media pass, and a copy of the book was included. The menu for the class was actually a selection of dishes that represented different points in Samuelsson’s life. To start, he talked about his upbringing in Sweden, the prevalence of fish, and all the ways it was prepared. He shared tips for curing salmon mentioning that it can be partially cured and then grilled, or it can even be frozen after being fully cured. He spoke about texture and how it affects our experience of flavors. 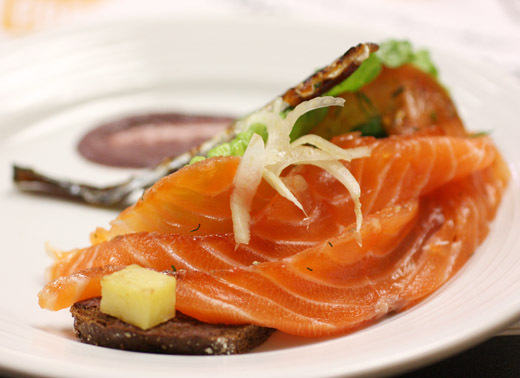 The first dish was gravlax served on a slice of pumpernickel with crunchy, pickled fennel, some fresh lettuce, cooked potato, crispy salmon skin, and purple mustard. It was a pretty mix of colors on the plate that tasted as good as it looked. The purple mustard made with red wine and port is something I look forward to recreating at home. Next, he talked about his career and his vision for a more socially responsible restaurant that would attract people from all walks of life rather than solely catering to those who could afford a fine dining experience. After working in several high-end restaurants both in Europe and New York, in 2010, he opened Red Rooster in Harlem. 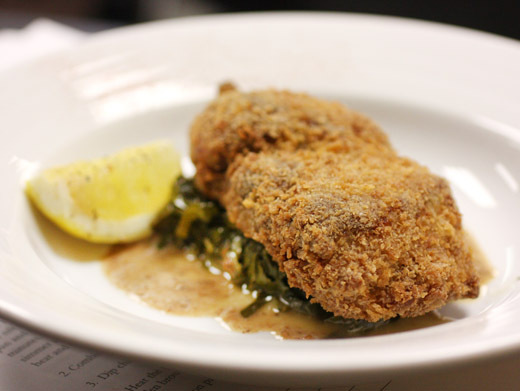 He intended to include fried chicken on the menu, and he wanted to create a version that expressed his culinary point of view. That became his coconut fried chicken. The version prepared in the class was seared chicken that was then stewed in coconut milk with garlic, chiles, and lime. After being cooked through, the chicken was allowed to cool, dipped in egg white, rolled in panko breadcrumbs, and fried until golden and crisp. It was served with collard greens that had also been cooked with coconut milk. Coming back to the importance of texture in any dish, quickly blanched bok choy was added to the simmered collard greens so there would be variety in the feel of the vegetable. The last dish of the evening looked to Ethiopia where Samuelsson was born. 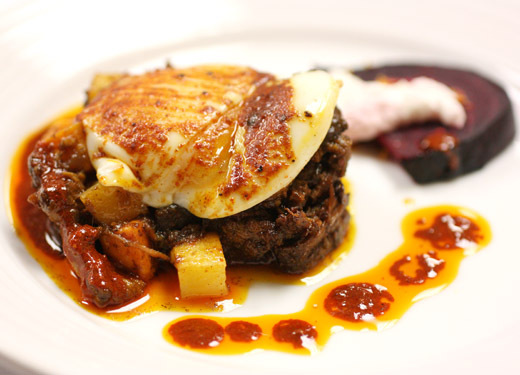 It was a lamb hash with potatoes, sweet potatoes, and beets topped with a fried egg. The hash was seasoned with bebere which is a mix of ground fenugreek seeds, dried chile powder, paprika, salt, ginger, onion powder, cardamom, nutmeg, garlic powder, cloves, cinnamon, and allspice. The book, Yes, Chef, begins with a moving description of Samuelsson’s mother and how he doesn’t remember her face. Although he doesn’t know what his mother looked like, he does know how she cooked. He knows she used berbere as did everyone in Ethiopia. He writes: “For me, my mother is berbere...” The berbere tinted the cooking oil a nice, reddish orange and gave the dish spicy depth. I’m thinking of recreating a vegetarian version of the hash, and I’m thinking of adding berbere to all kinds of other dishes too. The class brought food memories to life through dishes elevated with a chef’s experience. For the whole story, I highly recommend the book Yes, Chef. What a treat to get to experience Marcus in such a small venue. Sounds like it wax a great class and the dishes look delicious. I would love to try that fried chicken he's received so much acclaim for! A how great! A wonderful class and lovely food. Lovely post, great experience! I, too, would have jumped at the opportunity. Not sure I could concentrate much on his cooking, but I would not miss his class if I lived closer... just kidding, I have one of his cookbooks, and watched him on the FoodTV, he's a fantastic chef! How fun!! What an awesome experience, love Marcus ! We snagged a huge container of berbere after cooking our first Ethiopian dishes last year or so. It's a wonderful mix! I would love that opportunity. Nice pics. Wonderful experience:) Looks like fun. I'd love to take a cooking class with him! What fun! What a wonderful opportunity to take a cooking lesson from award winning chef. AMAZING! You are so so lucky!! Must have been such a fantastic class. What a great opportunity, Lisa. That class must have been a fantastic learning experience. It must have been awfully inspiring being around a chef of that caliber! A tad jealous! What a scrumptious opportunity to learn and be inspired by one of today's exceptional chefs! How cool Lisa...what a great experience...and the food look awesome. Great pictures! Sounds like a wonderful time - how great to learn from a master?! And thanks for the info about his book - sounds so interesting. sounds like a great experience! i will need to check out his book, it sounds fascinating! how cool, lisa! oh, the stories that man must have. This sounds like a wonderful experience. I'm a big fan of Samuelson and like his cuisine. You did a fantastic job in documenting his cooking class and his experiences as a chef.